When Glen Spurrell retired from his Toronto-based career and moved to the small village of Millbrook eight years ago, he brought with him an enthusiastic drive to roll up his sleeves and contribute to the fabric of the community. Interestingly, Glen had never heard of barn quilts when he was invited to join the CMBQT steering committee; the group responsible for overseeing the whole barn quilt trail project. 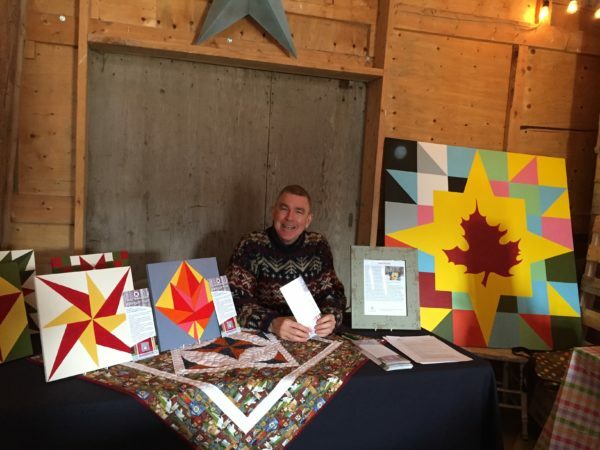 It was Glen’s monthly column in the Millbrook Times that clearly showcased his fantastic writing ability and landed him the job of documenting the interesting background stories about each barn quilt. Glen currently shares responsibility for writing the CMBQT background stories; a role that involves interviewing block hosts, doing a little research, and then wrapping it all up in a readable and enjoyable written format. Writing these stories challenges Glen to dig into local history a little; something he finds quite fascinating. 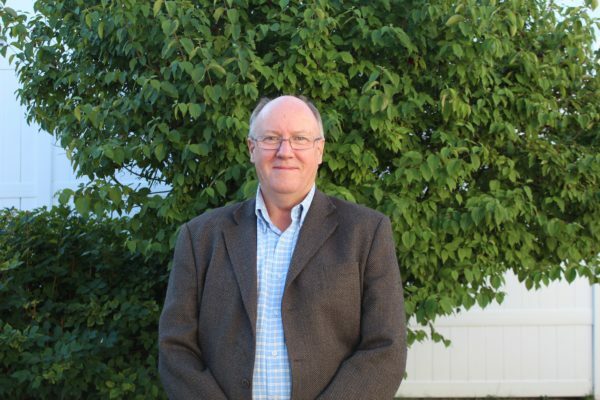 In addition to his participation in the CMBQT project, Glen has found himself volunteering for various local initiatives including the local trails committee, the board of the Cavan Monaghan Libraries, the local historical society and the garden club. 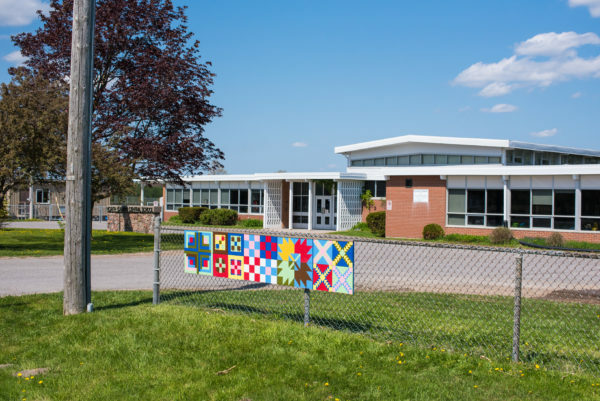 Driving past Cavan Monaghan’s elementary schools, you have likely noticed a charming array of quilt blocks, painted every colour of the rainbow. These beautiful additions to our schools are the direct result of a community partnership between local Principals, teachers and students, and Elaine Young, the School Liaison for the Cavan Monaghan Barn Quilt Trail project. The role of School Liaison was a natural fit for Elaine who enjoyed a 32-year career as an elementary school teacher and was the Founder (2012) and past-President of the Millbrook Needlers’ Quilt Guild. 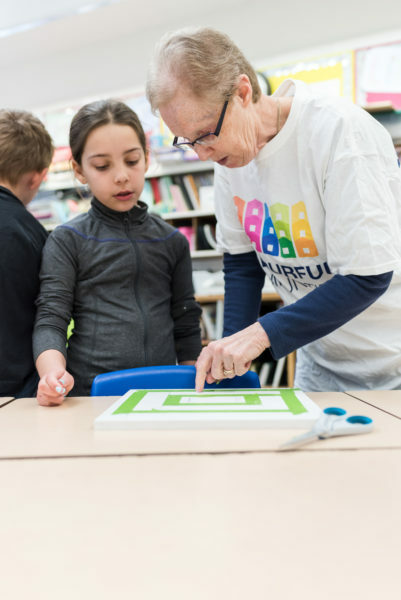 As School Liaison, Elaine reaches out to schools in the community to determine their interest in having students create barn quilt blocks, and meets with interested staff members to set up a work plan for the students. Elaine also spends time in the classroom teaching children about quilting – helping them to select appropriate blocks and then guiding them as they draw, tape and paint the patterns onto boards. 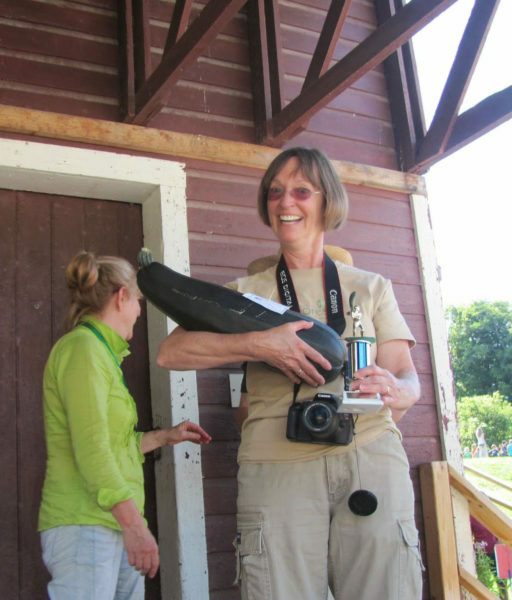 Elaine initially became involved in the CMBQT project when she was contacted by Chair, Lenka Petric who wondered if Elaine or her fellow guild members would be interested in some level of involvement with the program. As a quilter and a student of history, it sounded like an appealing opportunity for Elaine to pursue her hobby while learning about the community. Although her roots are in Scarborough where she was born and spent her career, Elaine and her husband moved to Millbrook in the fall of 2010. They have found the town to be very friendly and welcoming and thoroughly enjoy their home on the edge of town, surrounded by beautiful old homes and green space. In addition to quilting, Elaine enjoys knitting, gardening, jigsaw puzzles, reading and keeping up with her family including four step-children, nine grandchildren and three great-grandchildren. Jeanne Moran began quilting in the early 1970’s while living in Scarborough with her young family. Since then, her passion for her craft has remained a constant thread throughout her life. 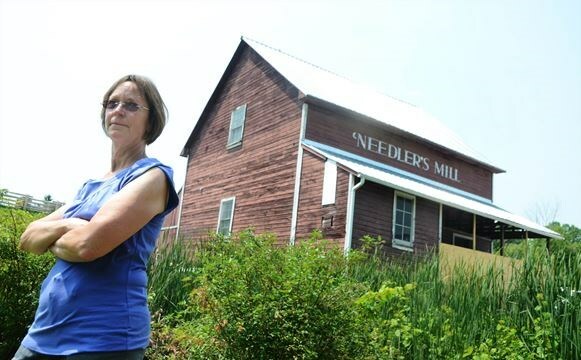 Today, Jeanne is a member of the Millbrook Needlers guild. 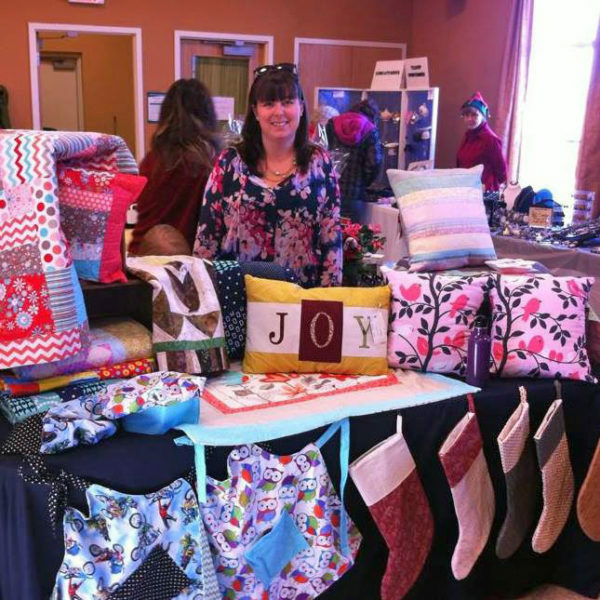 She also works with a group affectionately called the Barn Owls, a group of quilters who create and donate quilts to the Canadian Cancer Society; warming and comforting those affected by the illness. Jeanne moved to Millbrook with her husband Ed in 1987. She has remained active in the community and, when she is not quilting, she enjoys swimming, and participating in Church activities. 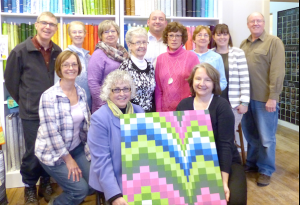 Jeanne was one of the first volunteers to join the Cavan Monaghan Barn Quilt Trail project team. She became immediately interested after attending a preliminary meeting on the project at the Township office. She was particularly excited by the deep involvement of the owners in quilt block design – telling the unique stories of their families and properties. A key member of the painting committee, Jeanne has painted most of the 4×4 quilt blocks that have been created to date. She gravitated to the painting role because of the combination of mathematics and art required. 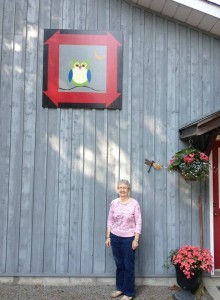 Interestingly, Jeanne was the first Millbrook resident to have a Barn Quilt displayed on their property – not surprisingly, it is a cheery barn owl who greets visitors to her home! 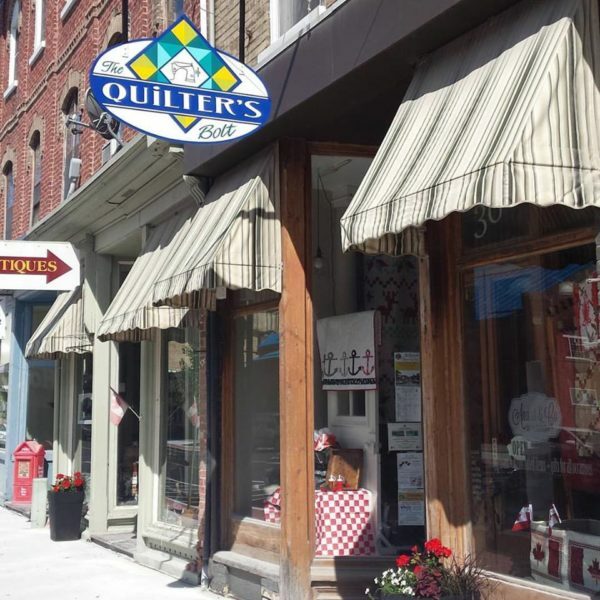 After 5 minutes of meeting Kate DeKlerck, you already know her top priorities in life – her family, her many friends, being active in the community of Millbrook, and anything and everything to do with quilting. Kate began quilting at the age of 21 while growing up in Peterborough. She was inspired to pick up this craft after trying her hand at a quilt for a friend’s new baby. During that process, Kate was offered a job at Quilts n’ Critters (then in Millbrook) as the owner liked Kate’s colour sense when selecting fabrics. She went on to work in the store every Saturday for a couple of years, learning more and more about quilting along the way. After finishing University where she obtained a BA in Human Services Management and a Diploma in Early Childhood Education, Kate worked in a licensed daycare centre for four years and then as a nanny and private childcare provider for about a decade, during which time she moved to Millbrook. Many evenings after working with children, Kate would make a cup of tea and retreat to her quilting room for some quiet quality time with her latest quilting project. In March 2015, Kate decided to take her hobby to the next level, leaving her childcare days behind to open her own quilting shop – The Quilter’s Bolt. When entering this charming shop at 30 King Street East in downtown Millbrook, customers are greeted by Kate’s warm welcome and the cozy yet modern vibe of exposed brick, local handcrafted merchandise and walls of beautiful fabrics. The opening of the shop was a dream come true for Kate, and to date has proven to be a source of joy and a successful business for her and a great addition to the downtown retail scene. From the back room of the store, Kate often teaches quilting classes and hosts the monthly Cavan Monaghan Barn Quilt Trail committee meeting, where all the great ideas and plans for the project are discussed. Kate was excited when the Cavan Monaghan Barn Quilt Trail initiative was launched – a culmination of many of her passions. She is currently a key member of the design committee and has worked on all the quilt block designs to date, finding the project a wonderful challenge. Kate’s favourite blocks are those that use a traditional design with a modern twist. Kate loves that the CMBQT committee is comprised of a great group of people from diverse backgrounds whom she may never have met without their shared passion for this community initiative combining art, quilting, agriculture and history. Although Celia Hunter has lived in the area since 1981, she jokes that this means she is still a “newcomer”. When her family first moved to Cavan Monaghan, they lived in Millbrook, however, they later bought a 20 acre parcel southwest of Millbrook which borders the former railway line and Baxter Creek. Celia enjoys being part of a small community and has certainly expressed that sentiment through her involvement in a number of local organizations over the years! For instance, she has served as writer and editor for local newspapers (a sure-fire way to get involved and learn about “what’s up”, from debates at council meetings to games on the sports fields) and as a framer, working for a local artist in his studio for two years. Celia is also the President of the Millbrook & Cavan Historical Society. She initially became interested in the CMBQT project as it seemed like a natural extension of this role; a community initiative with the potential to illustrate and highlight the township’s history. She continues to be involved in the CMBQT project in an effort to encourage the appreciation of local history and public art. As one of the writers on our CMBQT committee, Celia combines her love of writing with her passion for local history by thoughtfully documenting written descriptions of the barn quilt blocks. This involves consulting with the designers of each quilt block to understand what it will look like; conducting research about where the block will be situated and the history of the property and family; and lastly, interviewing the host(s) to uncover why they chose a particular block design and any special meaning. Celia also shares the role of keeping the minutes at CMBQT committee meetings to ensure committee members have a record of all discussions, decisions and progress. While her commitment to the community continues to be a source of enjoyment, Celia is concentrating much of her efforts these days on building relationships with four young grandchildren, maintaining her property with her husband of 40-plus years, and keeping her dogs fit with long walks on the Millbrook Valley Trails. As a child, Carolyn Brackenridge would watch intently as her aunts and mother would set up quilts on wooden frames in the dining room. This sparked her initial interest in quilting. More recently in the quilting front, Carolyn became involved in the Cavan Monaghan Barn Quilt Trail project; joining the initiative right from the get-go when some early members of the Committee drove to Prince Edward County to look at the local barn quilt blocks. As a key member of the Site Selection Committee, Carolyn scopes out potential quilt block sites in the township, speaks to the property owners and helps interested owners select the right spot to display their block. 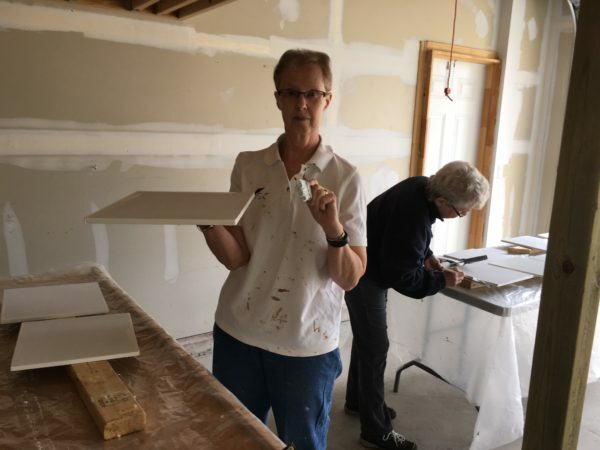 Beyond site selection, Carolyn helps the CMBQT project in a number of other ways including priming boards and setting up and staffing booths at events to promote the trail. Carolyn has lived in the south end of the Township since 1970, when she and her husband David relocated here from Lambton County with their young son Steven. In the fall of that year, the new Cavan Monaghan residents welcomed their second son Mark. A daughter, Karen, was born five years later. In 1980, the Brackenridge family launched a feed business which eventually spanned three stores; one at their farm in the township, as well as locations in Hastings and Port Hope. Carolyn managed the store in Port Hope for a time, followed by the Hastings location. When her eldest son Steven joined the family business, the Brackenridge’s moved the entire operation back to their home base at the farm in order to better serve the needs of their growing business. In addition to the family business and the CMBQT Committee, over the years Carolyn has been involved in the community through 4 H projects (teaching everything from sewing to bread making), being a minor hockey and figure skating mom, supporting initiatives for local youth, and helping with events at her church. 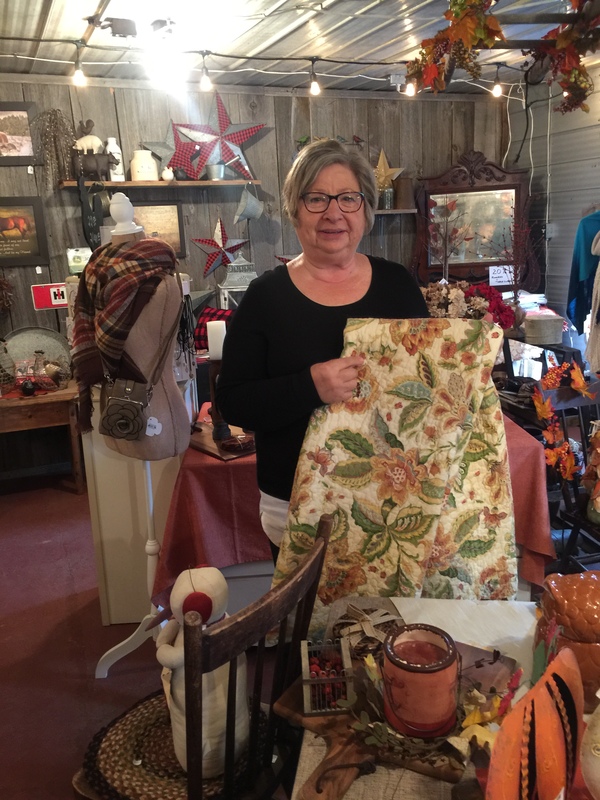 When she (mostly) retired from the feed business two years ago, she channelled her combined passions of farm life and store ownership by reimagining an unused room in the Brackenridge barn into a lovely shop selling a variety of home décor items and gifts. Co-owned with her friend Diane Anderson, Country Charm at the Barn is a seasonal store, open September to the end of December from Wednesday to Sunday, 10am to 4pm. Retirement has been good to Carolyn. In addition to her fulfilling work in the community, she is enjoying her time with her five beautiful granddaughters and one amazing grandson (whom she likes to tell is her “favourite” grandson). This year, the Brackenridge clan also added a special little girl to the mix, with the arrival of a great granddaughter, Josie. If you’re reading this profile on our website or Facebook page, you’re already familiar with the work of CMBQT committee member Bruce Gazley! Since 2015, Bruce has played a leading role in helping to establish and raise the profile of the CMBQT project through the creation of the CMBQT logo, graphic design, web development and maintenance and contributing to our social media channels. Bruce has also designed and procured marketing banners and stands for our pop-up presence at community events. Bruce became interested in the project in the fall of 2015 when he attended a BIA meeting during which project lead Lenka Petric presented her plan to develop the trail. The presentation included a call for volunteers to assume key roles on the CMBQT steering committee – including that of webmaster. Bruce expressed his interest to assist with the website, having spent two decades in corporate communications as a multi-media producer and16 years in educational technology as a project manager in application development. Bruce was eager to leverage his skills and knowledge to contribute to this community effort. Bruce and his wife Francisca are relatively new to Millbrook, having relocated from Whitby in 2013. When considering where to set down new roots, the Gazley’s focused on smaller communities with charm and history. For these reasons, Millbrook suited them perfectly and they purchased a charming Ontario vernacular farmhouse on Tupper Street. Since joining the Millbrook community, the Gazley’s have received a warm welcome from “the locals”. In fact, they have developed many lasting friendships and have been very proud to experience the lifestyle and community feel of the village. They also found the local history they were seeking when during renovations they learned that their house dates back to the mid-19th century. This inspired the couple to move beyond being Barn Quit Trail volunteers, to become a block hosts as well. Their home, affectionately renamed “Thornview” will soon bare a block depicting the brick-manufacturing enterprise of the Thorne family whose bricks built many homes in this area in the 1800s – the Gazley’s likely included. When not dedicated to the marketing and promotion of the CBQT project, Bruce puts his tech savvy to use in other ways. While he retired (officially) in 2015, Bruce has recently taken a two-year contract position with a local school boards’ IT department in Peterborough. He and Francisca also use social media (and frequent visits) to keep in close contact with their three grown children. Bruce’s other hobbies include playing acoustic guitar; with a particular fondness for folk and Celtic music. He and Francisca also enjoy the theatre, art galleries, live music and international and local travel – stopping into cafes and wineries along the way. This website is brought to you by…. This online presence has been made possible by our generous website sponsor, Nexicom. With reliable, high speed Internet access, local and long distance Telephone service, and the latest Digital TV and Security technology, Nexicom has become the telecommunications provider of choice for home and businesses in the Kawarthas. Nexicom’s legacy is rooted in its local community involvement and dedication in helping people. Supporting the Barn Quilt Trails serves the importance of maintaining the enriched history of Cavan Monaghan and ensuring the stories of the community will be shared for many years to come. Copyright © 2019 CMBQT. Powered by WordPress. Theme: Spacious by ThemeGrill.